Our Microfiber Wash Kit provides everything you need to keep your car, truck or boat shiny and spotless. Packaged in a black polyester pouch for easy storage and great visibility for your promotion. Pouch is 13″ x 10.5″. Wash Mitt: Features ultra-thick microfiber, which is super absorbent but cleans in the most gentle way possible. Nylon mesh on the back removes stubborn marks. Elastic cuff keeps mitt snug. Sponge: Sponge on the inside and absorbent microfiber on the outside. Holds more soap and water for fewer trips to the bucket. 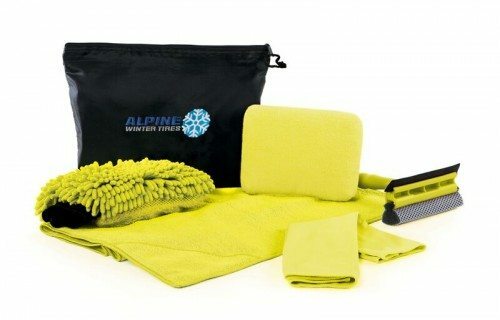 All-purpose towels: Can be used for washing, drying, dusting and polishing. Large towel with corner pockets: size 20″ x 27.5″. Glass towel: size 15″ x 15″. Squeegee: Non-abrasive sponge removes dirt and grime quickly and easily. Sturdy rubber blade wipes clean for streak-free, sparkling windows. Non-slip comfort grip handle. View our other microfiber products. Black pouch with yellow accessories. Machine washable for easy care. Wash cold – recommended to wash by itself. Gentle dry. Do not bleach. Packaged in a black polyester pouch. Everything you need to keep your car, truck or boat shiny and spotless. Pouch: 13″ x 10.5″. 80% polyester / 20% polyamide. Call for pricing.